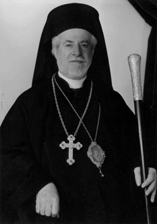 He studied at the Theological School of the University of Athens, from which he graduated in 1909. He was anointed Deacon the same year and Presbyter the next year. He became the Abbot of the Galataki Abbey and subsequently the Vice-Director of the Rizareiow School in Athens. In 1918 he was appointed Preacher in Sparti and left to continue his studies in the University of Oxford. In 1921, he moved to USA, where he stayed until 1950, rising as far as being Bishop of Boston. He became the Archbishop of Thyateira and Great Britain in 1951.